Installing our new round head wire end vise is simple and straight-forward. These wire end vises provide us with the opportunity to easily countersink the head. This provides for an even more low profile look. First, use a spade bit (size approximately 35mm) to drill a cylinder shaped hole. as shown in the picture to the below. 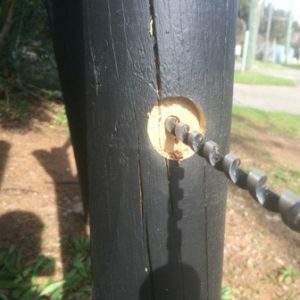 A spade bit can be easily attached to the average cordless drill and will make easy work of cutting a whole in any timber post. These are readily available at your local handyman store. The round hole will allow the round head of our wire end vise to fit snuggly inside the post itself. Next drill a whole through the post, as you would with any other installation through the centre of the whole previously created. We have used a 10mm bit here which would be the minimum size for our wire end vise. Typically customers use up to a 13mm bit to prepare their end posts to attach our rail. 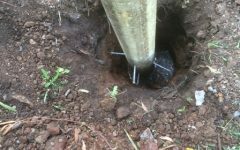 Some prefer the snug fit provided by the smaller bit, while others find it easier to use a large diameter when it comes to corner posts and crossing wires. 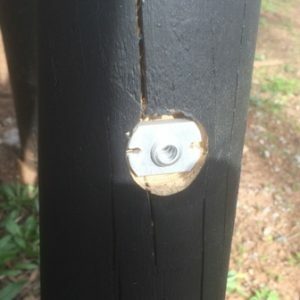 Once the hole is drilled through the post, the wire from our horse fence rail can be inserted through that hole and then through the vise. The picture to the right shows a round head vise neatly installed into the body of the post. 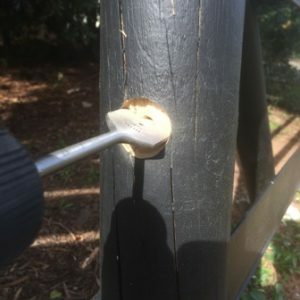 Please note this technique can be particularly handy when making H-Brace (or box brace installations). Often wire end vises are uses in conjunction with the diagonal wire brace in those installations. 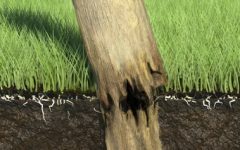 The ability to insert the round-headed wire end vice into the post on that diagonal angle makes installation easier and prevents any movement in that important structure. The use of a wire end vise is beneficial as the brace itself can be re strained easily and minimise your maintenance time.